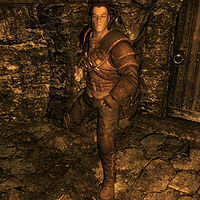 Garthar is a cocky Nord thief who joins the Thieves Guild after at least three special reputation quests have been completed. He was picked up by Vex after a roadside encounter with some wolves and it appears he has feelings for her. Once he arrives in the Cistern, he will be found wandering around and chatting to fellow guild members until 6am, when he takes a four-hour break to get some sleep in the bed to the left of the alchemy lab. His only other activity is training with his dagger in the training room between 2pm and 6pm. He wears the standard Thieves Guild armor, gauntlets, and boots. He is equipped with a leveled dagger (up to elven quality), a hunting bow, and twelve steel arrows. He also carries two lockpicks and up to 18 gold. When first met, he'll greet you with "We haven't met." and then he'll self-assuredly state: "Name's Garthar. Remember it, because you're going to hear a lot about me." After that, he say any of the following: "Still learning the ropes, but I'll get the hang of it. ", "Been doing a few jobs for Vex... how about you? ", or "Did you want something?" If you question him about how he got into the Guild, he'll gladly recount: "It's kind of an amusing tale. I was making my way down the road from Ivarstead towards Riften, and I saw Vex fighting off a couple of wolves. Well, there were eight of them and she'd already killed three by the time I joined the fight. Together, we made short work of them and the last one limped away licking its wounds." If you ask him if that's how he got in he'll smirk: "Actually, that's when she politely asked me to hand over my coin purse. Can you imagine? We scuffled for a while, broke each other's weapons, and finally fell to the ground exhausted. After a few minutes, she looked me dead in the eye and asked me if I wanted to join the Guild. Just like that, no apologies. Something told me I wouldn't regret it. I had heard the Guild was back on its feet again and most of Skyrim under its belt. I'll tell you, I wouldn't want to cross blades with Vex again, but I certainly wouldn't mind a bit of a scuffle..."
Before you've cleared Karliah's name, he'll warn you: "They're waiting for you in the cistern. No tricks.". After you've exposed Mercer, he'll angrily tell you: "If I find Mercer first, I'm going to crush his skull with my bare hands!" If you get expelled from the Guild, he'll refuse to talk to you: "Don't want to know what you did and I don't care. Just keep away from me." When you're done talking to him he'll cheerfully say: "Good luck on your next job." or "Off for some wine, eh? Drink one for me." Esta página foi modificada pela última vez à(s) 00h06min de 19 de setembro de 2013.